Solid wood dining chairs are a must for every well-dressed dining room. Here, we look at how to find the best set your home. If you’ve got a beautiful wood dining table, a set of wood dining chairs to go with your table is a must-have. Solid wood dining chairs are long-lasting, easy to maintain, and they can take whatever knocks your family throws at them. The dining table is the heart of a home, a place where family joins together every evening. Make sure that your family is comfortable with a set of dining chairs. These days, there is a multitude of styles and colors so you won’t be limited by choice when it comes to making your selection. Check out our collection of modern wood dining chairs for sale and choose the ones that suit your home and style best. Picking the best dining chairs is predominantly a matter of quality. The strength and craftsmanship of the chairs is very important. After all, no one wants their chair to break in the middle of a meal! Dining chairs are multifunctional pieces of furniture. While their main task will be to seat diners, they’re also easy to move around for use outside, in the kitchen, and in the living room. If you’re looking for something with a bit of a difference, try modern wood dining chairs. If a traditional style appeals to you more, try a set of solid wood dining chairs. Ask yourself what you’ll use your new chairs for. If they’re going to stay in the dining room, a set of elegant brown dining chairs is a good choice. A brown wood dining chair offers a traditional, classic appeal. Not so sure if brown dining chairs are for you? Read on for our how-to guide on choosing the best wood dining chairs, in any color. Size - Modern dining chairs come in many different sizes. This size is usually determined by the height of the dining table. Before shopping for chairs, measure your table’s height so that your family and guests won’t be sitting too low or too high. Style - There is an eclectic mix of styles when it comes to dining and kitchen chairs. Retro, vintage, modern, mid-century, and Scandinavian are all popular choices right now. Pick a style that you love and that you know will go well with your existing decor. Color - Wood dining chairs usually come in neutral or earth-toned colors. Untreated, light wood dining chairs offer a change from traditionally darker chairs and look great in a light and airy room. You’ll find many shades and tones to choose from including honey and mahogany. Material - Wood dining chairs as the name implies, are made from strong brown hardwood: mahogany, oak, and beech are all popular woods. The woods are processed and sometimes stained to bring out the natural color of the wood. Hardwoods last longer than softer woods like pine. 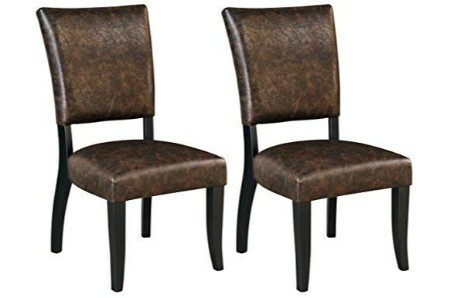 Black and brown dining chairs, made by: Signature Design by Ashley, model: D648-01. 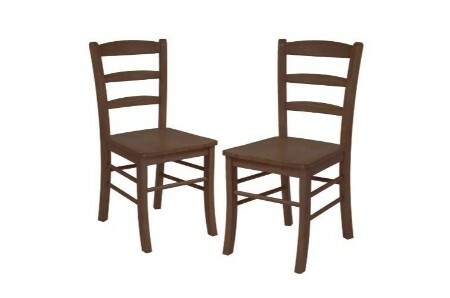 Made with wood, get it cheap, on sale, the best dining chairs, surprising home décor design piece, dimensions 19x24x39.6. Premium modern dining chairs. The best-selling dark wood dining chairs, made by Signature Design by Ashley, a beautiful living room layout accessory. Made of excellent wood, size: 19"Wx23"Dx38"H. This item received the best reviews for casual dining chairs, exceptional. The highest quality walnut solid wood dining chairs, manufactured by: Winsome Wood, astonishing kitchen masterpiece. Made with excellent solid wood, size: 16.6x20.5x34.7. On sale, the best mid-century dining chair, a great masterpiece. Brown wooden dining chairs, made by Signature Design by Ashley, model: D775-02. Material: wood, low cost tasteful dining chairs, size: 21.25"Dx19.5"Wx38.5"H. Add a splash of color to your day with this contemporary dining chairs. Make your friends' jaws drop with this brown leather dining chairs, by Roundhill, must have home décor adornment. Material: fine faux leather, dimensions: 21x16.5x35.5. Now on discount modern dining chairs, and that's just the beginning! Brown wood dining chairs, by: Signature Design by Ashley, model: D471-01. Made of prime wood, amazing living room masterpiece, size 24.75"Dx19"Wx40"H. Experience an adventure with this modern dining chairs, amazing and affordable unique piece! Finally, a perfect cottage oak wood dining chairs, produced by Home Styles, revives your style, a beautiful kitchen layout accessory. Made of top-notch wood, size: 22.2x18.8x38.4. 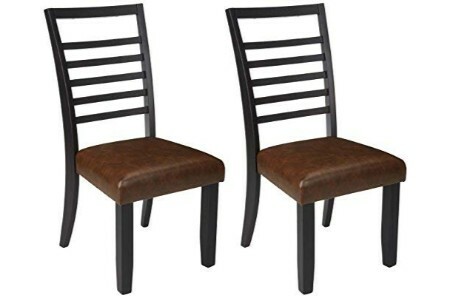 Save money with this casual dining chairs, a perfect work of art! Wood dining chairs, made by: Signature Design by Ashley, a must have dining room showpiece accessory. Made of first-class wood, dimensions 41.63"Wx21.25"Dx11.25"H. An affordable mid-century dining chairs, it's completely staggering. Get ready for the best brown wooden dining chairs, manufactured by Coaster Home Furnishings, a superb home décor masterpiece. Material: classic wood, size: 22.2x19.8x39. Now on discount contemporary dining chairs, a great masterpiece. Espresso fabric dining chairs, made by: Flash Furniture, model: 2-ES-CB-3950YBH-E-BGE-GG. Made of supreme fabric, on sale, the best dining chair, amazing living room layout accessory, size 17x18.2x38. On sale, modern dining chairs. Oak finish wood dining chairs, produced by East West Furniture, model: NFC-OAK-W. Made of supreme wood, special sensational dining chairs, a sublime kitchen piece, size: 18x17x36. Now you can get the best modern dining chairs, cheers! Top-selling brown dining chairs, by: Signature Design by Ashley, a cool dining room enhancement piece. Made with top-notch wood, size 40.75"Wx14.50"Dx18.50"H. Get a great deal for casual dining chairs, everything you ever needed. Wooden brown dining chairs, produced by East West Furniture, model: NFC-MAH-W. Made of wood, the best deal for noble dining chairs, a must have home décor fashionable piece, size 18x17x36. It's the real deal, mid-century dining chairs, perfect! Black and brown wood dining chairs, manufactured by Signature Design by Ashley, model: D580-02. Material: wood, a wonderful living room masterpiece, size: 40.50"Wx18.25"Dx11.50"H. It's the real deal, blending design and style perfectly. Add a splash of color to your day with this brown wood dining chairs, brand: Coaster Home Furnishings, a must have kitchen elegant piece. Material: the very best wood, dimensions: 22.2x21.8x39. Get a great deal for modern dining chairs, cheers! Black finish wooden dining chairs, produced by East West Furniture, model: AVC-BLK-LC. Material: wood, buy it now top rated for dining chairs, amazing dining room masterpiece, dimensions 18x18x37. Update your style with this modern dining chairs. If you are a fan of art you will love this brown wood dining chairs, manufactured by: Boraam, a superb home décor fashionable piece. Made with fine wood, dimensions: 18x16x35. The best deal for casual dining chairs, an ideal show-stopper! Black finish dining chairs, manufactured by East West Furniture, model: NFC-BLK-W. Made of the highest quality of wood, get a great deal for dining chairs, size: 18x17x36. Look no further and buy this mid-century dining chairs, affordable. Brown leather dining chairs, by LSSBOUGHT, model: 4W95-BRN. Made with fine faux leather, the best deal for dining chairs, a superb kitchen design piece, dimensions 21"LX17"WX35". Check this contemporary dining chairs, will blow your mind! Brown wood dining chairs, made by: MECO, model: 4533.6L842. 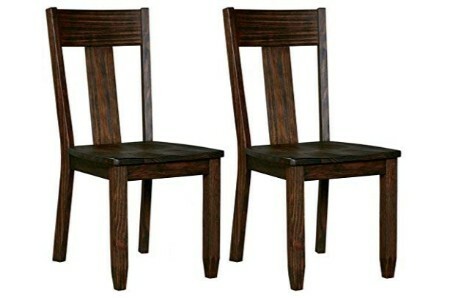 Made with wood, get it cheap, on sale, the best masterpiece dining chairs, dimensions 8x17x35.5. This simple and understated design is the best modern dining chairs, super fun! Brown wooden dining chairs, produced by Milton Greens Stars, revives your style, a beautiful home décor masterpiece. Material: high quality wood, dimensions: 18x40x17. Get a great deal for modern dining chairs, looks absolutely amazing and unique! 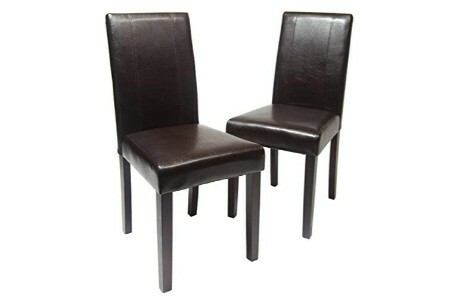 Brown leather dining chairs, manufactured by Coaster Home Furnishings, model: 102172. Made with the very best faux leather, save money with this decorative dining chairs, size 22.5"Dx19.75"Wx38"H. Check this retro dining chairs, a must try! It's the real deal, brown wood dining chairs, created by Signature Design by Ashley, nostalgic kitchen masterpiece. Made with excellent wood, dimensions: 43.25"Wx19.75"Dx12.75"H. Buy it now top rated for vintage dining chairs, a must try! Brown wooden dining chairs, a piece by Mr-Direct, model: MR-BR. material: excellent wood, luxury classy dining chairs, a must have dining room layout accessory, size 22"X16.5"X35". The best retro dining chairs, and that's just the beginning! An intriguing and eye-catching style right now is to mix and match dining chairs instead of going for a set of identical chairs. We love this trend for its quirkiness and fun factor. There is the potential for it to go wrong though, with that in mind, check out the following list of hints and tips on how to mix and match your way to style. Same chairs, different colors: This one is an easy way to inject a bit of personality into your dining room. Simply find a set of matching dining room chairs, or repurpose your existing ones, then paint each in a different color. Primary colors are bold and go well in rooms with white or off-white walls. Same color, different chairs: Another option which creates a cool and funky vibe is to go for different wooden chairs painted in exactly the same color. We love this look because it’s unexpected and very modern. It’s also super easy for you to do at home. Highlight the host: Place larger and interesting chairs at either end of the table. You can paint these to make them a different color, or even upholster the seats in a funky fabric. Placing eye-catching chairs at the table ends creates interest in a dining room. Mix retro and contemporary chairs: Consider arranging curvy, mid-century modern chairs with the sleek straight lines of contemporary chairs. Throw a few rustic beauties in for good measure and you’ll have an eclectic feast for the eyes. You could also lose the chairs and make use of benches for an informal, stylish feel. Textual unity: Sometimes, the best way of bringing together different chairs is not by matching styles or through the use of the matching colors. A unified texture among your chairs, no matter how different the chairs are, will create a cohesive space. Try an interesting fabric or a distressed wood finish to create texture. The best-selling rustic brown wood end table, manufactured by: Signature Design by Ashley, a must have home décor enhancement piece. Material: the finest wood, size 29.50"Wx25.75"Dx10.25"H. Customized retro end table, don't linger around! Prepare yourself for the best rustic brown wood coffee table, made by: Signature Design by Ashley, a delightful living room accessory. Made with the finest wood, dimensions 45.50"Wx31.50"Dx8.50"H. The best modern coffee table, amazing! This is one of the coolest tan fabric dining chairs, by: Roundhill Furniture, a wonderful dining room upgrade piece. Made of top-level fabric, dimensions 26x18x39.2. Now on limited time discounts for casual dining chairs, incredibly cool! Brown wood dining bench, made by: Signature Design by Ashley, model: D469-08. Made with top-level wood, this is the best price for luxurious dining bench, a beautiful home décor classic accessory, dimensions: 37.50"Wx21.50"Dx36.75"H.
Best seller grey brown wood dining bench, made by: Signature Design by Ashley, a must have dining room elegant piece. Made of prime wood, dimensions: 44.00"Wx22.50"Dx37.25"H. Now on limited time discounts, looks absolutely amazing and unique! Awesome, check out this brown metal dining table, manufactured by: Signature Design by Ashley, must have dining room fashionable piece. Made of top-level metal, dimensions: 44x44x30.8. On sale, the best modern dining table, coolest ever!